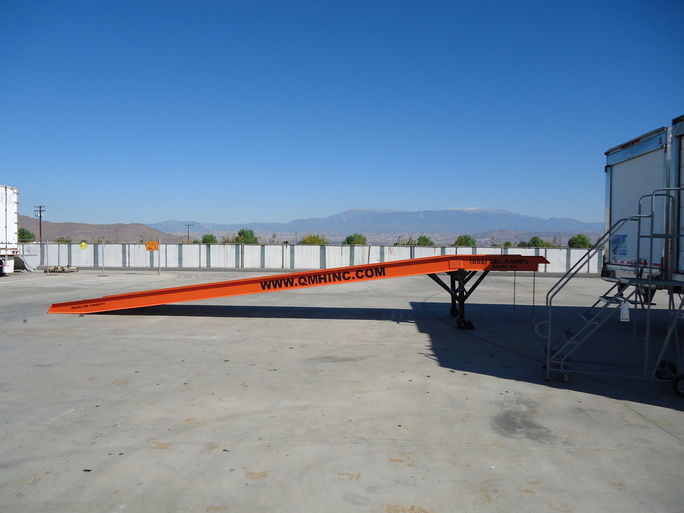 Yard Ramps | Quality Material Handling, Inc.
Yard Ramps. Portable. Flexible. Quality. Let the professionals at QMH supply you with the right yard ramp for your warehouse. Whether you need a portable ramp, access ramp, forklift ramp, or loading dock, our high-quality, portable yard ramps are designed to provide superior, safe, and consistent performance day-in and day-out for large and small companies. With a yard ramp from QMH, you’ll have fast load turn around times and the flexibility to handle any sized job. Rely on QMH yard ramps to get the job done right. Manufactured on site, right here in the USA. Widths of 6, 7, 8, and 9 feet. Hand railings, all-terrain wheels, custom colors, lengths, and alternative capacities available. Industry leading one-year warranty against manufacturing defects. Call 855-SEL-RAMP today for details! Yard Ramps—also known as portable loading ramps, portable loading docks, or forklift ramps—are the efficient, cost-effective, and safe solution for common loading dock problems. Mobile yard ramps come standard with a 6-ft. level-off zone to ensure safe and easy forklift access onto containers and flatbed trucks. QMH portable yard ramps are manufactured with American-made steel. 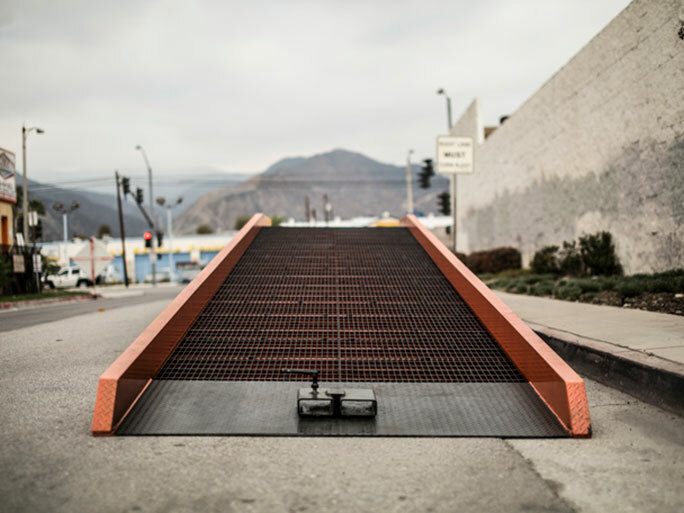 QMH ramps are constructed and welded in California. Ramps are designed with a 12-in. thick channel for lasting durability and increased strength. Serrated bar grating ensures excellent forklift traction—even in adverse weather conditions. 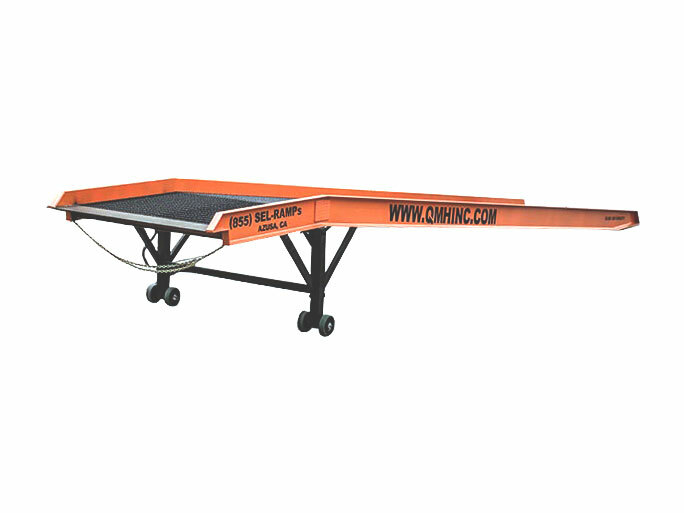 All portable yard ramps come with safety chains as a standard feature. Please see the charts below to learn more about our forklift ramps and their specifications. 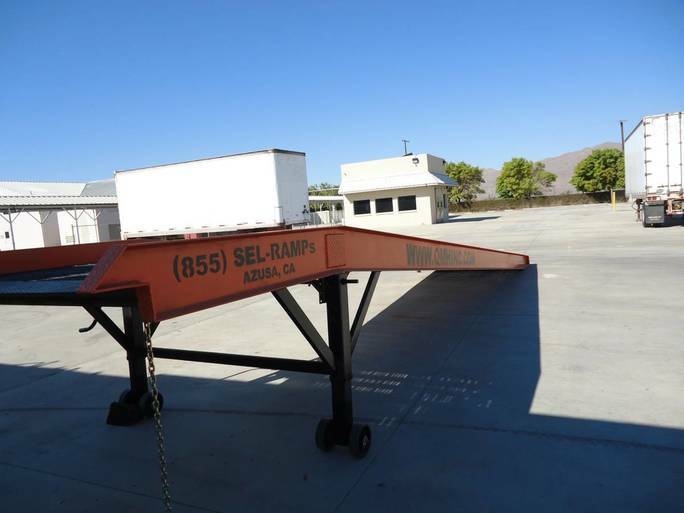 Call 855-SEL-RAMP to speak with a Yard Ramp Specialist today and find the perfect yard ramp solution for your business! Why Use a Mobile Ramp Versus a Concrete Ramp? If you’re looking to invest in more dock equipment for your facility, you may have considered installing a concrete ramp. Mobile access ramps have more to offer and can be superior to concrete ramp installation for various reasons. Here are a few reasons why using a portable access ramp is the smart decision. You ramp is ready to use upon arrival with no assembly necessary. We ship directly to your facility within days of your order. You save time and resources with no planning and pouring—you don’t need to wait for a mobile ramp to cure! Mobile ramps are ready for immediate use, no matter the weather. As your business grows or relocates, the mobile ramp goes with you. Concrete ramps remain at the old location—along with your investment. Mobile ramps don’t require approval and permission for rented facilities. Concrete ramps do. Mobile ramps use steel serrated grating for excellent all-weather traction. Concrete becomes slick in icy or wet conditions. Mobile ramps have no drainage issues. Mobile ramps are not limited to a single entry, location, or facility. Makes distribution center reorganization quick and easy. Mobile ramps help allow your business to grow and be more productive. Concrete ramps are fixed and limit the ability of your business to change. A quality investment with excellent resale value. Let your next investment in dock equipment benefit your business! Call 855-SEL-RAMP today to speak with one of our dock equipment experts. We can custom-build and will buy used materials at a fair price! Why work with QMH's ramp experts? 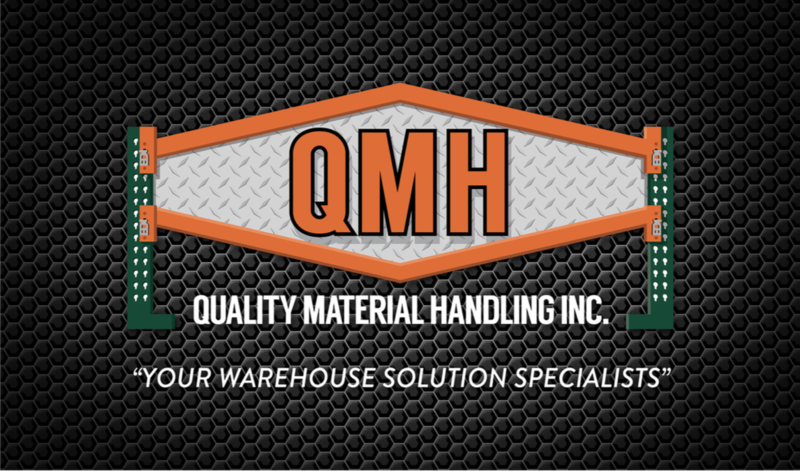 QMH yard ramps are priced competitively. But, think quality, not price! A high-quality yard ramp from QMH is an investment that will perform for many years. Why buy a mobile ramp? Mobile ramps afford you the versatility that helps your business to grow. If you relocate, you can take your ramp with you! Fixed concrete ramps stay where they’re poured—and so does your investment. What should I consider before buying a yard ramp? Construction. Ramps experience heavy use. Our ramps are constructed to hold up to years of industrial wear. 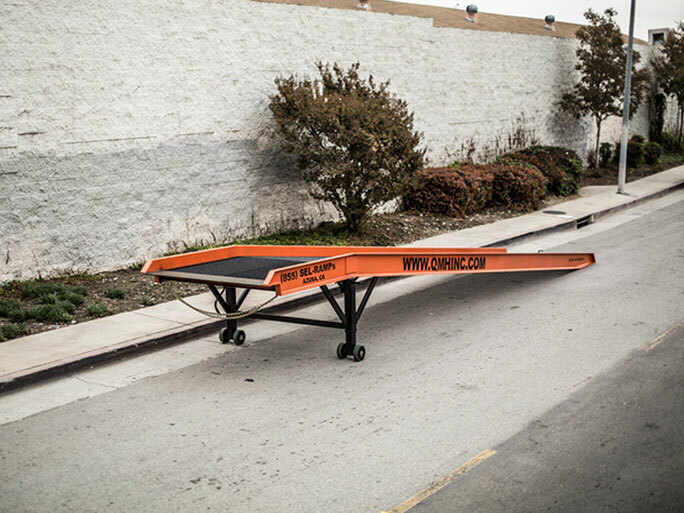 What are your yard ramps made out of? All our yard ramps are made with high-quality steel. Steel is king! It’s important to me that I buy made-in-the-USA. Where is your steel sourced? Our high-quality steel is manufactured in the USA. Where are your ramps made? All our ramps are are constructed and welded in California. What’s the load capacity of your ramps? QMH yard ramps have a 20,000 lb. capacity. But we can customize your ramp for greater capacity. What other custom options do your offer? We can customize your ramp with all-terrain wheels, hand railings, different load capacities, different colors, widths between 6-9 ft, and various lengths. We will do our best to provide you with the the ramp exactly suited to your needs. Do your ramps have level-off zones? Yes! We can’t emphasize enough the importance of level-off zones. Level-off zones provide an even dock connection. A level-off zone is important for safe, smooth unloading transitions. Like level-off zones, approach plates make the transition from ground to ramp and vice-versa smoother and safer. We take safety seriously. 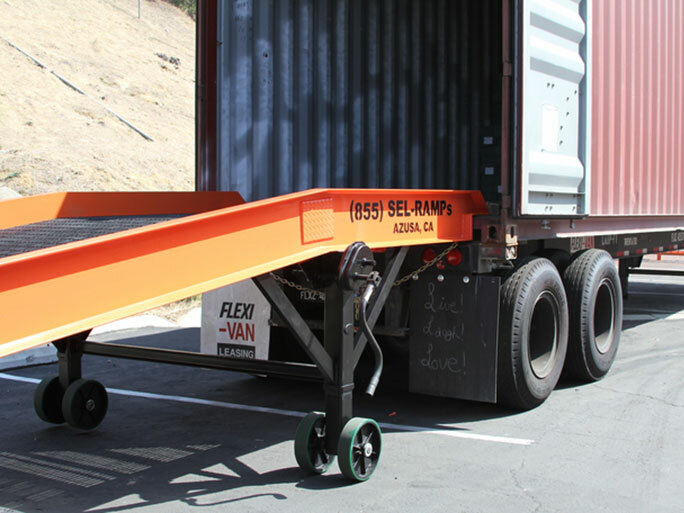 All portable yard loading ramps come with a standard safety chain. Our ramps are offered in various widths to ensure forklifts and employees alike have the space necessary to perform their tasks safely. And don’t forget, we offer custom hand railings and all-terrain-wheels for extra safety. Do your ramps work well in wet weather? 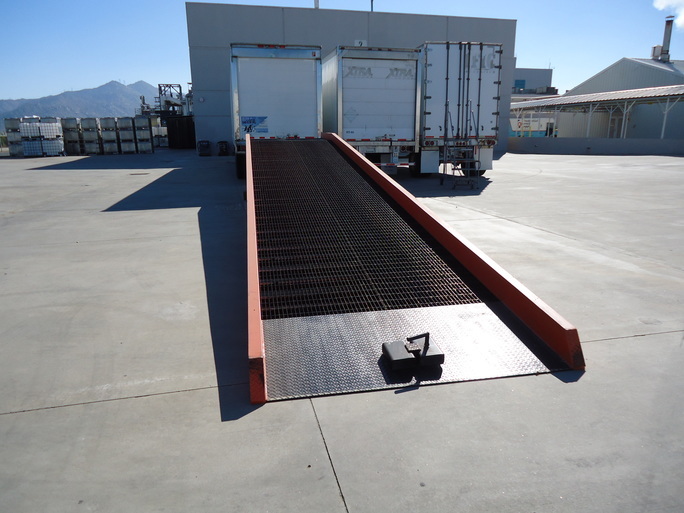 Our ramps ensure excellent foot and vehicle traction because we use thick, serrated bar grating floors for maximum safety and weight capacity. Have Questions? Contact our team of yard ramp experts!